Creating a social media strategy takes time to research and write, but not all digital marketers have enough hours in the week. Altering existing strategies can be difficult, too. The online landscape — be it platforms or audiences — continuously changes and forces the need to refine new tactics. Download our free social media strategy template to help develop a plan with more ease and speed. The opening section of the strategy should identify traditional business goals that social media activity will help meet. The goals must adhere to the SMART method — they need to be specific, measureable, attainable, relevant and time-based. “Generating leads” isn’t time-based, whereas “generating 10,000% more leads in a day” isn’t attainable. On the other hand, “generating 10% more leads over a month using targeted ads and content” meets SMART criteria. Defining goals — and keeping them in mind while completing the template — will ensure your social media strategy has a clear focus. Think of sub-goals as SMART steps that help reach your overall goals. Not only will these help you meet overall goals, but guide the Tactics and Content sections of this social media strategy template. Determining target audiences is an essential part of any social media strategy, as they may differ from your brand’s normal key markets. One or Two Primary Audiences. These are typical customers who — ideally — will engage with your profiles and visit your website or physical locations. They can also be prospects who are demographically similar to your customers yet haven’t made a purchase. Two or More Secondary Audiences. These are consumers who don’t coincide with your brand’s typical customers. This could be due to their age, income or other factors. However, they should be interested in your products or industry. Your target audiences can vary between social media platforms due to user demographics and their activity levels. Regardless, determining target audiences helps you craft posts that better resonate with readers and viewers. By examining content and activities that do and don’t work for competitors, you should have a better understanding of which tactics resonate with your target audiences. Adopt the content and posting strategies that consistently generate engagement and correlate with follower growth. This should hasten your development of a dedicated audience. Similar to analyzing competitors, examining your brand’s existing profiles will help determine tactics that will and will not work with the new strategy. Accessing this data will help guide you through the Channels, Content and Tactics sections. The purpose of this section is to identify social media platforms that can deliver ideal results based on the Business Goals, Sub-Goals, Target Audiences and Competitor Analysis parts of the template. Business Goals: Your ultimate goal is likely to increase sales. If you’re a company with photogenic products, make Pinterest a priority. Strategists say users log onto the platform with the explicit intent to make purchases. Plus, Pinterest has buy buttons. Sub-Goals: If you prioritize developing a large following, devote substantial resources to Facebook. As of April 2016, it is the most popular social platform at more than 1.5 billion users. For comparison, Tumblr has 555 million and Instagram has 400 million. Target Audiences: For brands with target audiences made up of teenagers and young adults, make Snapchat a focus. Although it lacks metrics marketers value, it is the most popular platform among this demographic as of February 2016. Competitor Analysis: If the bulk of competitors see desirable results on Twitter but can’t crack the code to Instagram, you should be able to build a strong Twitter presence from the outset. Contrarily, you’ll need to determine if you can use Instagram to get a leg up on the competition. Social media content should align with your sub-goals, whether they be to spread awareness, generate engagement or drive traffic back to your website. Keep your primary and secondary audiences in mind when determining these aspects. For example, would a group of educated adults respond to a formal or informal tone? Due to the fluidity of content creation and sharing, this section isn’t set in stone. It should simply be your initial content plan. Your social media strategy is built on the tactics that you’ll describe in this section. They should combine the Content and Channels sections, which draw on other areas of the template. For example, one tactic may be “run a week-long ad that targets audience X using keyword Y (content) on social platform Z (channel).” Then, note your expectation for the tactic. You can compare it to the result later, guiding future strategies. Social media monitoring can play a strong role in most strategies, as the practice can reveal trends and messages you wouldn’t have otherwise noticed. Reacting and responding can lead to more followers and engagements. You may even convert a dissatisfied competitor customer. Searching for these terms can reveal a range of questions, complaints, reviews and other content. Social media monitoring can also involve searching through profiles of influencers and users who frequently interact with you, looking for posts to share. This can help build relationships with your followers. Regardless, you’ll have to know how to respond once you find people who have questions, concerns and comments. Refer to the next section to help address them. Creating set responses for questions, complaints and other comments can prepare you for a range of social media situations, helping ensure each interaction goes smoothly. Consider that 67% of consumers have used social media for customer service inquiries, according to JD Power. What’s more, Forrester research states 71% of customers say that valuing their time is the most important aspect to providing service. These statistics show the need for — and value of — quick and helpful responses. Take the story of Delta Hotels and digital strategist Mike McCready as an example. 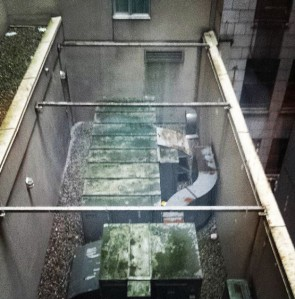 He didn’t tag Delta, but the company responded to his tweet before day’s end and offered a room with a better view. You can follow Delta’s example by creating responses for common issues, reacting in a fast and helpful manner. The purpose of this section is to designate responsibilities, according to the Tactics section of the template. 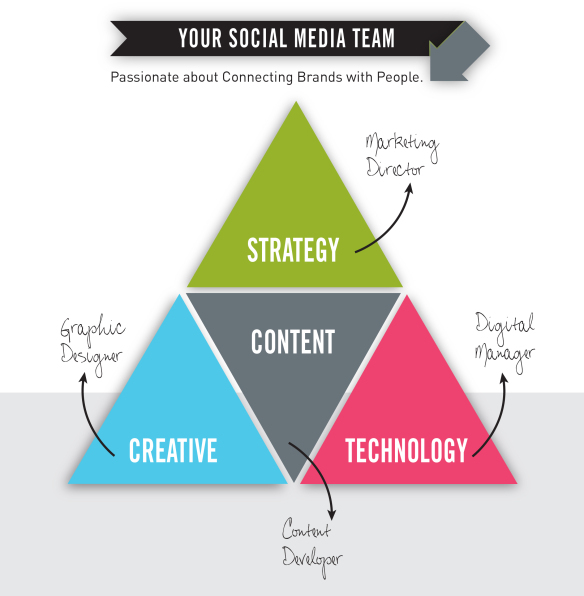 It can also act as a social media team hierarchy. If so, describe who reports to who and which roles involve approving content. You must determine how much money a social media strategy needs to succeed, or else you’ll risk ignoring resources and not meeting goals. If your boss or client does not approve your budget, you may have to adjust the entire strategy. The Ongoing Performance Analysis is a simple set of questions to help improve your social media strategy. The social media lead should answer them every month or quarter. Address them with the Business Goals and Sub-Goals sections in mind. 1. What’s working and in what sense? Describe each tactic that’s yielding desirable results. Then, explain why it’s working. Is it due to frequency? Because it hits an audience pain- or emotional-point? By understanding why a certain tactic works, you should be able to craft approaches that deliver similar benefits. 2. What’s not working and why isn’t it? Describe each tactic that has fallen flat. Then, explain why you think it didn’t succeed. By doing so, you should be able to determine if you can fix something. For example, you may not be sharing a content piece during optimal times. Keep in mind, you may want to test a tactic for more than a month before declaring it a failure. 3. How will we amplify and do more of what’s working? Determine how you’ll dedicate more time to tactics that generate results. This could mean stopping social activities that don’t do as well or devoting extra resources to strategy execution altogether. Regardless, answering these questions will help you critically examine — and continuously optimize — your social media strategy’s performance. Refer to these explanations when using our social media strategy template to create a strong, detailed plan. To gain ideas about how to complete the downloadable social media strategy template, read about the five examples below. Keep in mind, they don’t describe ongoing plans. Instead, they focus on campaign strategies. 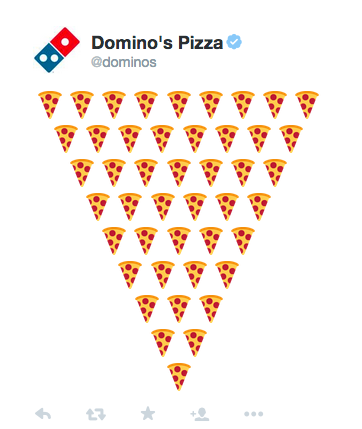 Some digital marketers don’t see the value in emojis, but Domino’s used them to simplify ordering. Once customers register their Twitter handles with the restaurant chain, they can tweet a pizza emoji at the Domino’s account. Domino’s sends a direct message to confirm the order before sending a delivery person to the customer’s home. For Twitter users, ordering a pizza has never been so easy. For Domino’s, making a sale has never been so simple. Charity WATERisLIFE demonstrated how to capitalize on a trending hashtag, quickly growing its Twitter following. #FirstWorldProblems frequently trends, as people complain about issues such as laggy Internet. The charity used this opportunity to share an original video called First World Problems Anthem, comparing problems in the developed world to those faced by people who lack clean water. The video went viral on Twitter and Facebook, drawing attention to the charity and its cause. Estonia’s tourism ministry not only drove engagement by creating unique content, but successfully encouraging consumers to do the same. The marketing team published more than 90 30-second videos showcasing cities, beaches and other attractions. The team then selected almost 100 people to blog and post about their travels in the Baltic nation. This generated exposure on search engines and social platforms, driving traffic to the ministry’s website. Essentially, Estonian marketers found an effective way to spread favourable, yet objective, word-of-mouth through digital content. This shoe brand demonstrates its philanthropic side through Instagram, boosting engagements and impressions along the way. 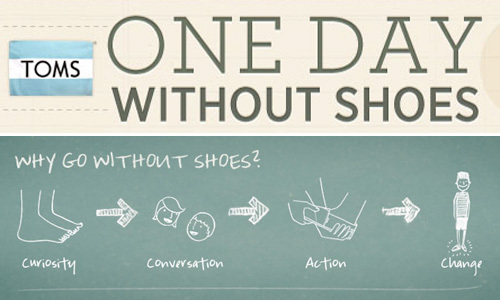 Each May, TOMS donates a pair of shoes to children in need on behalf of each person who posts their bare feet. They just have to tag the image #WithoutShoes. The campaign ties TOMS to kids health and education, earning the support of Instagrammers across the globe. 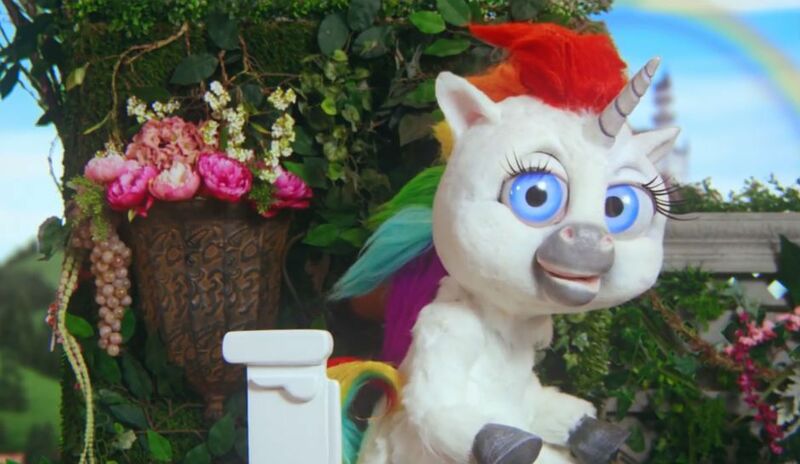 Squatty Potty mixed comedy and education by publishing a video about a unicorn showing proper toilet posture. The product is a stool you can use to lift your knees while on the toilet, relaxing your colon. This prevents issues such as bloating and constipation. To date, the video has almost 25 million views on YouTube. The approach allowed Squatty Potty to address an uncomfortable issue to connect with this target audience, generating sales and social buzz. Use this template and the five strategy examples as a starting point. Combined with the explanations of different sections, they’ll help you develop a comprehensive and effective social media marketing plan. If you use the template for an ongoing strategy, be sure to regularly update it as you refine content and posting tactics. Plus, once you surpass your goals, you’ll have to alter approaches to reach new social media heights. Hi! Thank you for providing this really insightful article and template. It really did save me some time as I was just about to dive in to a new social media strategy–I will be using some elements of your template. Glad you found the article useful. I’ll actually be adding a couple of sections to the post and template (monitoring and responding) next week. Thanks for the shout out and link back to my blog. Delta Hotels really did go over and above. Your post is well-written and comprehensive. I’ll definitely be sharing it. The Delta example truly shows the power of social media monitoring. Thanks for writing about your experience. New to the industry and i’m loving all your blog spots, great insight and the template is priceless. I’m sharing with a client and this is exactly what i needed to bring the account home. That’s great to hear, Jonathan! Best of luck with the client. Hi Marcus , I found your article very useful for social media i have applied some of these and i got a positive result also . Thanks a Marcus for sharing such a useful information .